Infinite Words is an important theory in both Mathematics and Computer Sciences. Many new developments have been made in the field, encouraged by its application to problems in computer science. Infinite Words is the first manual devoted to this topic. 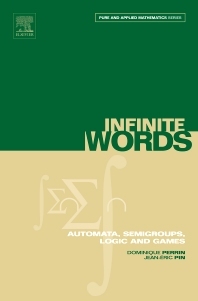 Infinite Words explores all aspects of the theory, including Automata, Semigroups, Topology, Games, Logic, Bi-infinite Words, Infinite Trees and Finite Words. The book also looks at the early pioneering work of Büchi, McNaughton and Schützenberger. Serves as both an introduction to the field and as a reference book. Contains numerous exercises desgined to aid students and readers. Self-contained chapters provide helpful guidance for lectures. Researchers and Graduate Students in Mathematics and Computer Sciences. Computer Science Engineers.